It’s already Wednesday, hooray! Having that Monday off at the beginning of the week really helps move things along, right? Let’s make Mondays off a thing, 4 days is enough in a work week and 3 days seems perfect for a weekend. How did you live up your holiday weekend? We spent a lot of time outside grilling, drinking beer with friends, and soaking in time with my family, perfection. 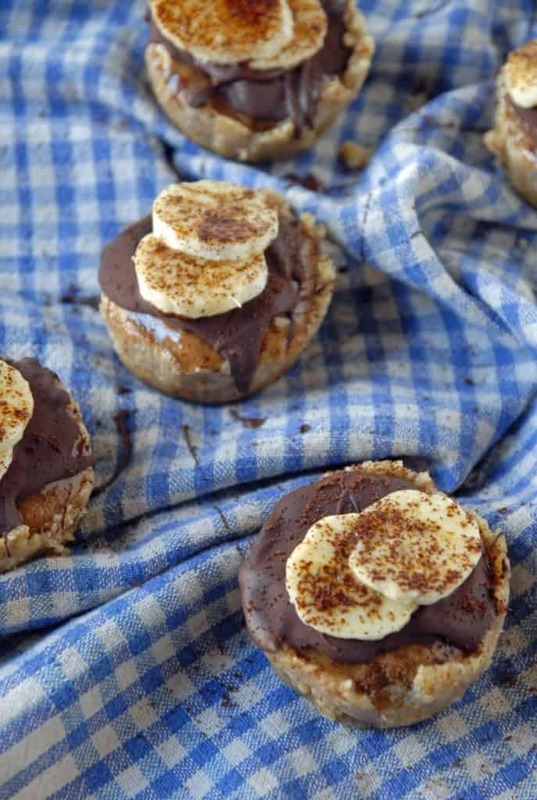 I usually send a few desserts home with my parents when they come to visit, but I kept these mini banana espresso tarts all to myself this time (they would melt on the way home, you know?). I actually haven’t shared these with anyone outside of my boyfriend, so I’ll just keep on eating these straight out of the fridge with no plate to catch the crumbs until they are all gone. 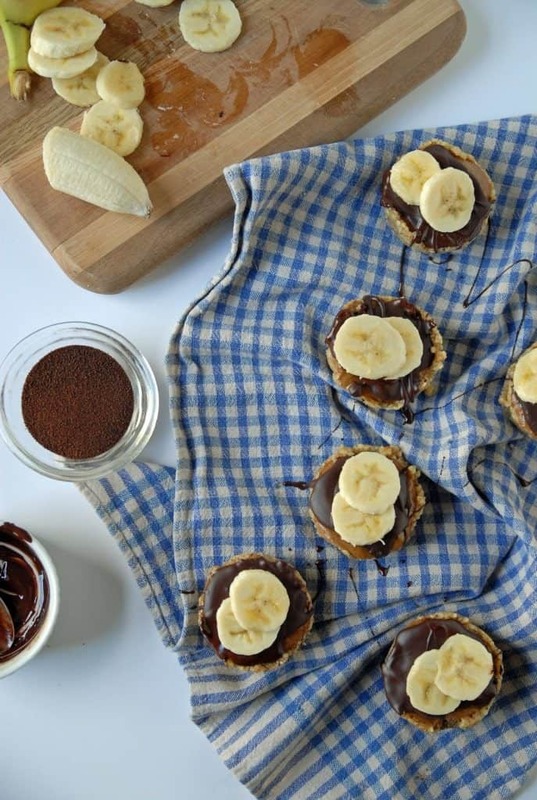 I usually try to mask the banana part of my desserts, usually since they are being blended into a dough or used as an egg substitute, but when I whipped together these tarts, I knew I had to keep them just they way they are. I loved that these required no baking, no toasting, none of that business. Just whir everything together, pop them in the freezer and voila, they are ready! If you don’t have espresso powder strong coffee would do the trick, or feel free to sub in cocoa powder to add another layer of chocolate in there. Either way, we are entering into no bake dessert territory with the weather here (80 degrees in an old house can feel way hotter! ), so I expect these to be in heavy rotation come this summer! Grease 6 cups of a muffin tin, set aside. In the bowl of a food processor, combine the crust ingredients and pulse until fine. If mixture does not come together easily, add a bit more maple syrup. Once mixture is ground fine, line the 6 cups of the muffin tin with the crust, pressing into the bottom and sides of the cups. Place in freezer while preparing the filling. Rinse out the food processor and replace. Place filling ingredients into the bowl of the processor and process on low until smooth. If mixture does not come together easily, add a bit of almond milk to get the mixture going. Once mixture is smooth, pour filling into prepared crust cups. Freeze for at least 4 hours. 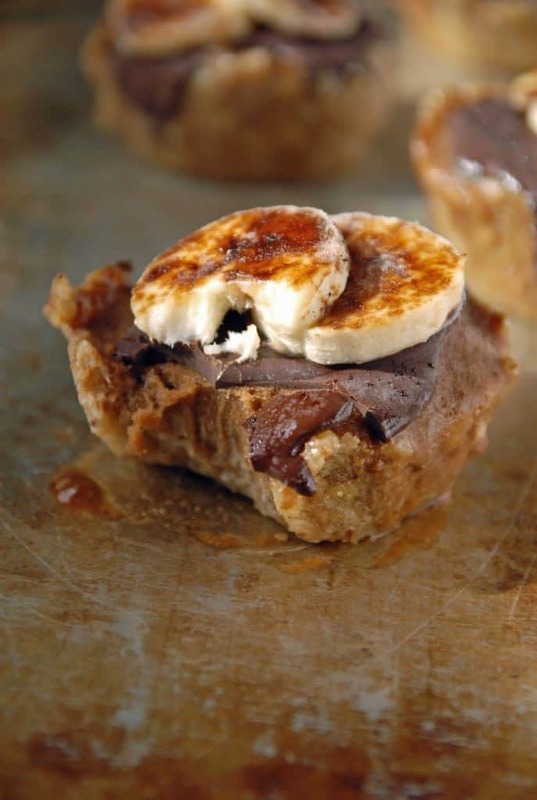 Top with melted chocolate, sliced bananas and sprinkle with espresso powder. I love the walnut crust idea! Thanks! These look TOO good. I wouldn’t share either. 😉 And as you know from your visit, Florida is already in the sweltering temps, so these look perfect! Thanks Dianna! It looks like you guys are heating up quickly down there, we are still hovering in the 50’s some days here! Abby, these look incredible! I’m collecting a bunch of no-bake recipes to make this summer and this one is going on my list! I can’t handle how good these look! Love having little treats in the freezer for when the craving strikes too. I have been using a walnut based crust for tarts lately and I really love the texture it produces. These little minis look delicious! 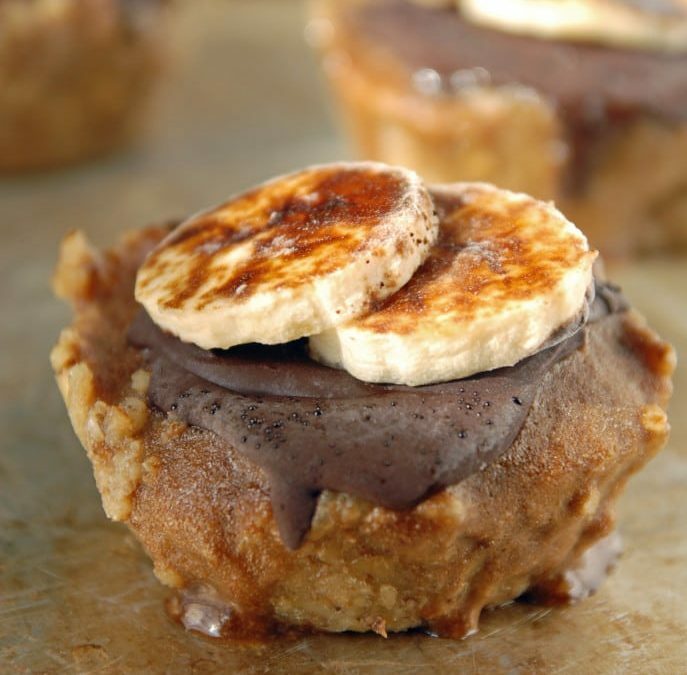 Love that these are no bake! 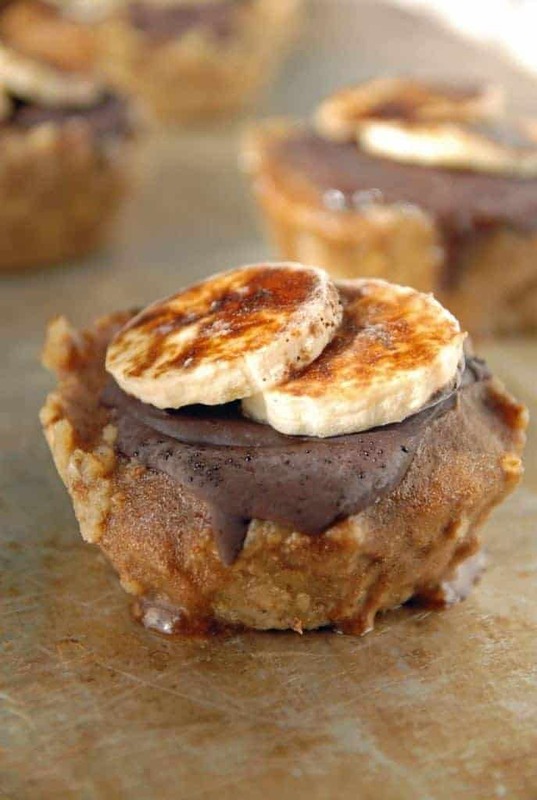 I have some bananas at home that are needing to be used, and I cannot wait to transform them into this beautiful dessert! These look seriously amazing. I mean, look at those gorgeous bites of perfection! It’s my first visit to your blog and I can tell that I’m going to be spending a lot of time drooling… uh, I mean… READING and gaining inspiration right here! I’m not strictly vegan but I do eat about 80% plant based (and a few of my friends are vegans) so I cannot wait to try some of these recipes. Thanks!